The Arts Promotion Centre Finland (Taike) has awarded its #movingart Theme-Year Prize to the Artists at Risk (AR) programme of Perpetuum Mobile. The amount awarded is 5000 euros. The director of Taike Minna Sirnö presented the award to AR’s directors Marita Muukkonen and Ivor Stodolsky on Friday 8 December 2017 at the Smolna palace in Helsinki, in the context of the State Prize awards. Perpetuum Mobilε is immensely honoured to win this prize for Artists at Risk (AR). We would like to thank all of our partners and friends, and especially the City of Helsinki, for their special support. In particular, we would like to thank Nasima Razmyar (Vice-Mayor of the City of Helsinki) and Thomas Walgren (City Council Member), who were our guests at the ceremony. 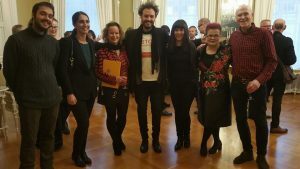 Also in attendance were Baran Çağinli, a current AR-Resident (AR-Saari Residence/Saastamoinen Foundation) and Sanni Kahileinen of the Finnish Musicians’ Union. We wish we could have invited more of you! In general, we would like to profess our profound thanks to all of our wonderful partners. The members of our AR-Safe Haven Helsinki Advisory Council have played an extraordinary role. This informal council includes representatives of the City of Helsinki Cultural Department (observer status), HIAP – Helsinki International Artists Programme (which has excelled as our primary hosting organisation in Helsinki), the Artists’ Association of Finland, the Finnish Musicians’ Union, the Finnish Musicians’ Union, the Finnish Music Council, the Saastamoinen Foundation (observer status), the Finnish Institute in the Middle East, the Anna Lindh Foundation Finnish Network, PEN Finland, the Finnish Human Rights League, Pietarsaari City (observer status), the Baltic Circle Festival and others making up what might be considered as a “commons” dedicated to the well-being of AR-SHH and its residents. Last but by no means least, we would like to thank our international Advisory Board members for lending their energy to our cause: please read more on AR’s About page.